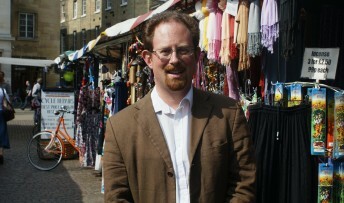 Cambridge MP Julian Huppert has bought one of the first seats in a virtual football stadium as part of a project which helps homeless people across the world. Julian’s life-long seat is among the first 10,000 to be sold to launch the project with the aim of reaching a million seats. The stadium, which will become the largest virtual football stadium ever is designed as a home for the fans and supporters of the Homeless World Cup. The competition has been staged every year since 2003 in countries across the world to bring together homeless people through football. Last year 64 countries competed in Poland. A network of 70 international partner organisations support the Homeless World Cup using football to improve the lives of homeless people throughout the world. The Homeless World Cup supports ground roots football programmes and social enterprise development. Julian said: “I am delighted to be able to be given the chance to buy one of the first seats in this virtual stadium. Football is our national game and there couldn’t be a better way to get homeless people together in this country and internationally. You can buy your own seat here. Julian’s seat is in the virtual stadium is Tier: 1, Section: 1, Row: O, Seat: 14.